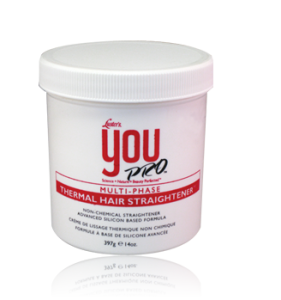 YOU PRO™ Multi-Phase Thermal Hair Straightener™, Non Chemical Thermal Straightener option for all your clients. Advanced silicon based formula provides a humidity resistant barrier for non-relaxed hair. This non-greasy product is revolutionary and provides all your straightening answers! For use on color treated hair, virgin hair, and that transitional client growing out of her relaxer. Next level in cuticle reshaping! Would this product still keep your hair straight even when sweating from a work out or if rain touches it, also how long does it last for. Hair might revert from a workout and definitaely if hair gets wet from rain as this product is not a chemical, but is a temporary sealant that seals hair from humidity when applied before using a heated straightener, unless hair gets excessively wet!! !